Davidsonville Elementary School PTO » Imagine, Believe, Achieve! Register for the Gator Gallop! School Play tickets now on sale! Spring Running Club – ready, set, go! Hosted by the Davidsonville Elementary School PTO. The evening features 80’s cover band “The Reagan Years” playing two sets. There will also be amazing silent and live auctions with unbelievable goods to bid on. Food, dancing, raffles, and the always-fun Prize Wheel! so grab one now if you haven’t yet. Order tickets online NOW using PayPal. Just visit this link and fill out the form. But hurry, they’re going fast! You can find the paper order form there too, but it might be a bit late for that now. Did you get your Gator Gamble ticket yet? 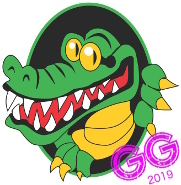 Gator Gamble Tickets ON SALE NOW! Wear your PJ’s on Friday!